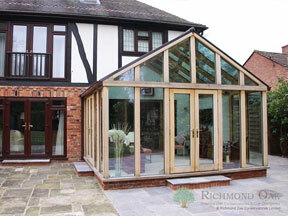 Richmond Oak provide bespoke hardwood conservatories and orangeries manufactured from a choice of different woods. However, it is no accident that 85% of our clients choose beautiful seasoned oak wood complimented with high performance conservatory glazing as the base material for their hardwood conservatory or orangery. If you require that very special new garden room, then let Richmond Oak design that unique ‘wow’ environment for you that will leave your friends impressed by your choice. Revered for centuries as the king of woods, oak is an exceptional timber whether painted, stained or left natural and has been used for structural frames, windows, doors, fine furniture, kitchens and staircases in many a stately home. 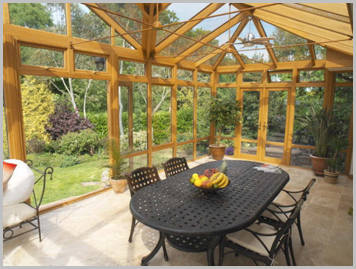 A hardwood conservatory or orangery built from oak provides a perfect entrance to the garden, the natural honey colour of the oak blending with the natural colouring of trees, flowers and vegetation. Whilst your oak conservatory will retain a furniture finish on the inside, you have a choice concerning the external finish. If painted with a microporous paint, your oak conservatory or orangery can be any colour to compliment the windows of the house. Popular choices include shades of grey and green, albeit any BS colour or RAL colour can be provided without difficulty. Many of our clients choose to have the external finish in a translucent stain, Light Oak being the most popular. The pigment in the stain provides protection from the ultra-violet light from the sun. However, some clients wish to achieve the appearance of ‘green oak’ and if left unfinished, the exterior will go grey and eventually silver with age and within a few years will have the appearance of having been an integral part of your home for many years. Our patented, direct glaze Contemporary range* provides unique features whereby the glass is direct glazed into 110mm square post and looks particularly good unfinished on the outside. *”UK Patent GB2483519″. This seasoned oak construction method allows the glazing of the high specification glass direct into the main posts without the problems associated with glazing into green oak. If you study the photos in the gallery, you will also see that changing the proportions of glass to frames provides everything from traditional to contemporary appearance.